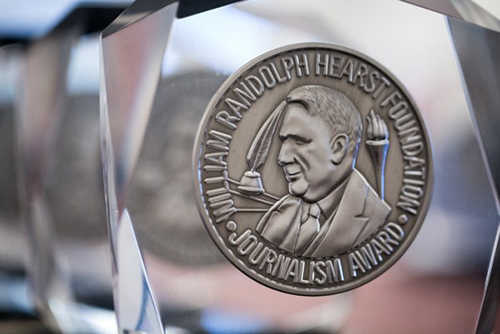 WKU’s School of Journalism & Broadcasting has won the Hearst Journalism Awards Program’s Intercollegiate Photojournalism Competition for the 25th time in the past 30 years. With two top 10 finishers in the Photojournalism II– Picture Story/Series Competition and first-place and ninth-place finishers in the Photojournalism I Competition, WKU had the highest accumulated student points in the 2018-19 photo competition. WKU’s School of Journalism & Broadcasting will receive a $10,000 award. The top 10 finishers in the 2018-19 Intercollegiate Photojournalism Competition are WKU, University of North Carolina at Chapel Hill; Ohio University; San Francisco State University; University of Iowa; Arizona State University; Ball State University; University of Nebraska-Lincoln; University of Oregon; and University of Kentucky. In the Photojournalism II competition, Michelle Hanks, a senior from Chattanooga, Tennessee, finished sixth, and Michael Blackshire, a senior from Louisville, finished seventh. Often called “The Pulitzers of college journalism,” the Hearst Journalism Awards Program, in its 59th year, consists of five writing, two photojournalism, one radio, two television and four multimedia competitions offering up to $700,000 in scholarships, matching grants and stipends; 105 member universities of the Association of Schools of Journalism and Mass Communication with accredited undergraduate journalism programs are eligible to participate in the Hearst competitions. The points earned by individual students in the monthly writing, photojournalism, radio, television and multimedia competitions determine each discipline’s Intercollegiate ranking. The winners are those schools with the highest accumulated student points in each category. The overall Intercollegiate winners are the schools with the highest accumulated student points in the writing, photojournalism, broadcast and multimedia competitions. In 2018, WKU won the Hearst Intercollegiate Multimedia Competition for the seventh straight year and won its fourth overall national championship in the Hearst Journalism Awards Program. WKU won overall titles in 2000, 2001 and 2005 and has finished in the top three overall for nine straight years and in the top eight nationally for 25 straight years. WKU students have won 15 Hearst individual national championships since 1985 — photojournalism in 1987, 1988, 1991, 1992, 1996, 2004, 2005, 2006, 2008, 2010, 2014 and 2016; multimedia in 2015; writing in 1985; and radio news in 2006.